In discussions and debates, people can present their arguments with terminology that is designed to draw emotional responses from people who are listening or reading. Some manipulative debaters attempt to provoke their opponents into making mistakes with ad hominem remarks and loaded words. There are times that loaded wording in debates, discussions, or various presentations can be painfully obvious. In other cases, the wording can be subtle and not necessarily manipulative; it may simply be a reflection of the speaker or writer's feelings. We tend to frame our views in the best light and cast a shadow on a contrary viewpoint. People do that. A subtle but manipulative tactic in using loaded words is using something that ends in -ism. Atheists and evolutionists have been known to contrast science with creationism, which may imply a feeling that creationists are members of an aberrant cult that has no science supporting it. Proponents of universal common ancestor evolution tend to get on the prod when they encounter someone using the word evolutionism. They may even accuse biblical creationists of using a nonexistent word to denigrate evolution. Darwinism? That's okay, because it's a philosophy or worldview, but evolution is science in their view. Unfortunately for their position, evolution is an -ism, it is more than just a study of biology — it is indeed a worldview. 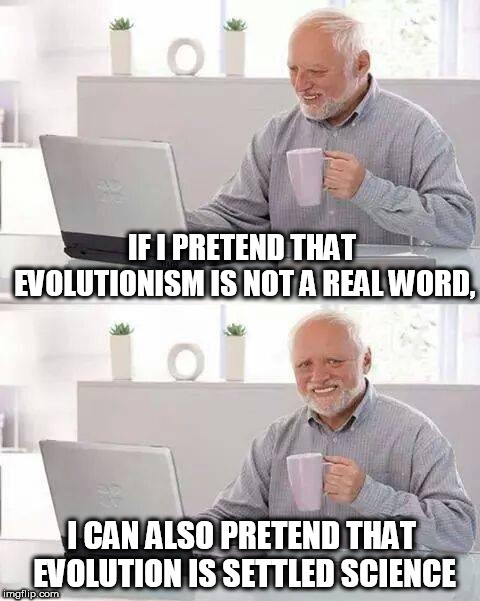 Interestingly, although some dictionaries tend to downplay the word evolutionism or ignore it entirely, but evolutionists themselves use it. Also, creationists don't pay no nevermind to the word creationism for the most part, and we use it ourselves. Also, Darwin's social media warriors claim to believe in evolution because it's "settled science", but they show ignorance of the science they claim to support. (I reckon that they're actually being dishonest as well as ignorant.) The "facts" of evolution keep changing (as links in the posts on this site will show you), and some folks just don't want you to know that we were indeed created. God is the Creator, and he makes the rules. Better find out what he has to say, whether you like it or not, and while there's still time. Eternity is a long time to be proud, arrogant, and wrong, old son. To read the rest, click on "Evolutionism—Is There Such a Word?" The Cosmic Axis of Evil?